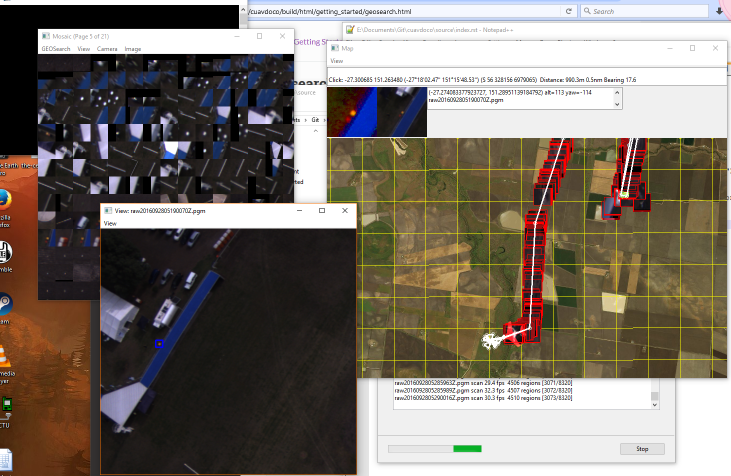 This program searches a set of photos taken by a UAV and looks for any interesting or unusual objects (such as stranded people). Any candidate objects are georeferenced on a map and shown to the user. The overall objective is to quickly and easily find the location of a missing person, based on a set of photos taken overhead by a UAS. The algorithm used in geosearch is very conservative and errors on the side of caution when deciding if an object is "interesting" enough to flag to the user. Thus it is expected that many false positives are detected, at which point it is up to the user to figure out if an image contains the desired person or object. The algorithm is tuned for finding person-sized and shaped objects that contrast well against the background. So a person laying down and wearing high-visibility clothing is easily found. It has been (somewhat humorously) noted that sheep to fit in this category too. If no arguments are supplied, a GUI appears asking for startup options. 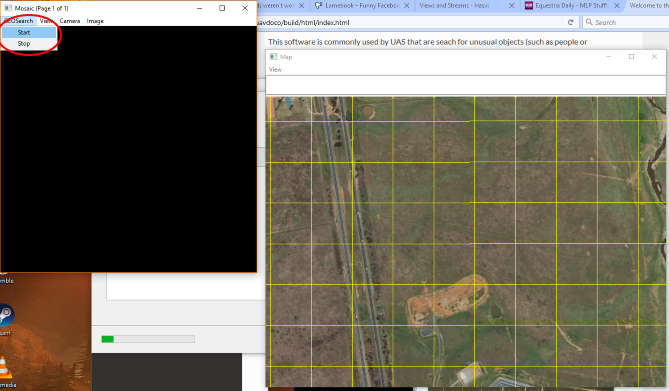 After starting Geosearch, 2 windows (by default) appear - a "Mosaic" window that shows a cropped image of any detected interesting images and the "Map" window which shows the location of the cropped image (plus UAV, if using a tlog). To start the processing, go to GEOSearch -> Start in the menu of the Mosiac window (see below image, start button in red). 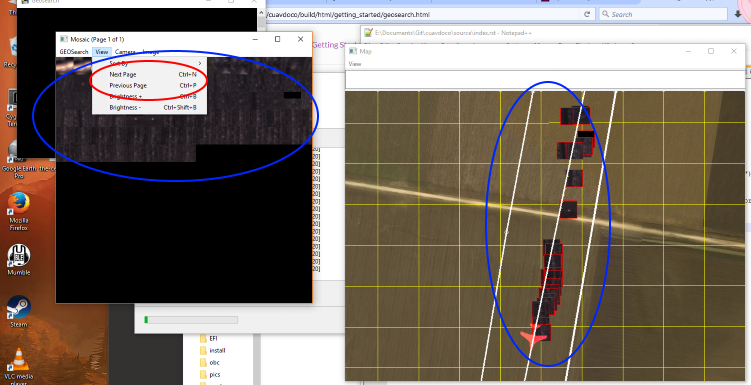 Once started, the GEOsearch runs through the images (and tlog, if used) at a faster-than-real-time rate. 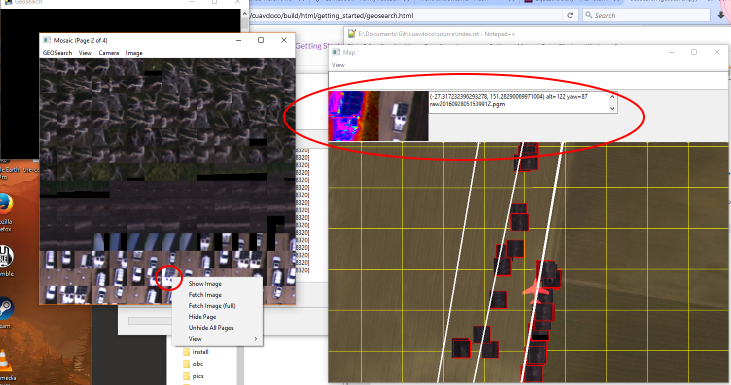 As interesting objects are found in the images, a cropped image of the detected object is displayed in the mosaic. If many images are found, use the View -> Next Page menu to scroll to the next page of the mosaic (in red, below). The objects in the mosaic will all be geolocated onto the map (in blue, below). Left clicking on an image in the mosaic opens an information box in the map window (in red, below). This shows a high-contrast version of the detected object, plus its location and image file that it appeared in. Right-clicking on an image in the mosaic gives a menu. Use Show Image to open a separate window showing the entire image with blue boxes around the detected object(s) (see below). This is useful for showing the broader area around the detected object, giving better context.